ROSEMARY HARRIS: Maybe everyone else has already done this and I'm the last to get the email, but last month, while visiting a friend, I noticed that she had two monitors on her desk. Two computers? Nope, dual monitors connected to the same computer. Always a late adapter, I said "why?" really thinking who needs that? She does a lot of volunteer work for her kids' school and it helped her organize the information on their website. Unlike simply having two windows open, the really cool thing was that you could slide something from one screen to another. As someone who writes with an outline it's been great to be able to have the manuscript on one screen and make notes on another. RHYS: Count me as the last person on the planet after you. I had never heard of this before. I write with a white board beside me and Post-it notes on the board and I could actually have electronic post it notes. We have any number of monitors around the house, so please divulge what kind of cable I need between the two and exactly how this works. DEBORAH CROMBIE: My husband works with two monitors all the time. Absolutely necessary for doing web page design work. But it never occurred to me that I could use two monitors! Only problem is I work only on my laptop, but that's another subject entirely. Maybe it's time to rethink the issue. In the meantime, however, my two recent techno OMG HOW COOL! advances are software. Thanks to a recommendation from Jeff Abbott, I discovered Inspiration. It's a mind-mapping program designed primarily for teachers, but it lets me storyboard in a way I've only been able to do on paper before. And I'm also working in Scrivener for the first time, which is just now available for PCs. Not sure I've completely got the hang of it, but it's fun, and allows me to organize and shuffle the writing and research in ways I could never do until now. Whether either of these will entirely replace the pencil-and-paper outline remains to be seen. HALLIE EPHRON: I've been wondering about Scrivener. I may try it when I start the NEXT novel. I did know about dual monitors - I'd see it first in a video editing suite. I don't have room for two monitors in my office, so it's a moot point. HANK PHILLIPPI RYAN: I inadvertantly did this. I used my laptop for research at the same time I was using my desktop for writing..and it was blissful! Yeah, I like it. It completely works. But to do it all out, I'd have to have some smart person come and install the whole thing, and right now I don't have time for that. Right now, I just scribble notes on a pad next to my computer. It works. My big change--this time I got a Book Notebook, with tabs. And thats as high tech as I'm getting. Sigh...I just--want to finish my new book. And then I'll think about the rest of it. JULIA SPENCER-FLEMING: When it comes to the technology of writing, I'm just one step up from a Royal typewriter. I compose on a laptop, with multiple windows open for edit page, name bible, research, questions and notes. All my other stuff - working out the themes, the relationships between characters, diagrams and timelines and plot branches - is done in pencil and paper on a hard-bound composition notebook. I've tried various Inspiration-style software and it's never worked for me. For some reason, anything more structured than a blank sheet of paper croggles my creative mind. I do have one recent piece of software I'm enjoying very much: FREEDOM, http://macfreedom.com/ a program that locks you out of the internet for a pre-determined length of time. Invaluable for a procrastinator like me! 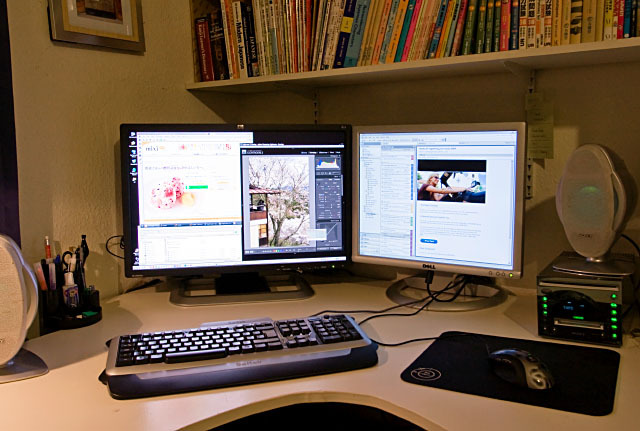 JAN BROGAN : My husband has the two monitors and the ability to slide between them. It seems like overkill to me at least for what I do. But I do have a laptop and an enormous MAC that allows me to put up multiple screens. But I also think that there's something about writing long hand on paper that activates the creative side of my brain - so I stick with it for certain planning aspects. LUCY BURDETTE: I've been thinking about Scrivener too, but don't have time right now for even the most gentle learning curve. The Guppies chapter of Sisters in Crime are all talking about trying it. I don't have two screens. I have piles of scraps and articles and notes I can hardly decipher spread about my office and our bedroom. Sigh...it's like my bedroom IS the second screen. ROSEMARY: For those who are interested, here's the link to how to do it. http://www.microsoft.com/athome/organization/twomonitors.aspx Seriously, once I had the cable it took about 5 minutes. Your computer needs to have two ports on the back, one for each cable. They will most likely be labeled VGA and DVI. My older monitor only had a VGA connection so on that one I went VGA to VGA. On the other DVI to DVI. Then you go to your control panel and choose how you want the screens to appear. Screens 1 and 2 is (that sounds wrong but it isn't) the option you want. I still write in pencil on a legal pad but it's been great to be able to add to the manuscript and my outline at the same time. Also a little easier for me to edit as I've been able to add to chapter notes while I'm entering new text. I keep wondering about Scrivener, too. I'm afraid if I start investigating it now, however, it'll just turn into elaborate procrastination. "They will most likely be labeled VGA and DVI. My older monitor only had a VGA connection so on that one I went VGA to VGA. On the other DVI to DVI." I also write only on laptop. When my last desktop died, I replaced with a laptop that had more everything than both my old laptop and desktop. I did discover a useful software tool on a website for writing tools. It's called Natural Reader and has a free version and priced versions with more sophisticated voices. It will read any text aloud and is great when editing. First runthrough, I use it and catch lots of infelicities. I just use the free version because the slightly awkward computer voice helps distance me from my words and really spot awkward spots. And I can't believe I'm on Jungle Reds again before writing. Bad Linda! Good Linda...this is about writing so it's okay! I know, Hank! She who has no Tivo and took 3 months to learn how to turn on her own television set. It's a miracle. I'm also a laptop user, but I've turned my TV into a second monitor before--not that's fun! Thanks for all the info on the latest software everyone is using... Anything to help fix that dreadful first draft! ::chuckles:: I do like that title: "writing in a parallel universe". As much as I love computers and always thought I got into the Library field too soon because I wanted the shipboard computer or better yet Memory Alpha of STAR TREK, ... I've always thought I tended to be non-tech, one foot firmly still in the paper dimension, and thereby would've thought I'd be the last person to do something "techy" like work with 2 monitors. HOWEVER, I write this on one of my two monitors. DH surprised me with it a few years ago, worked with a local computer company to build the computer with the two monitors just the way he wanted it while I was away working with my sister to finalize tending to our late father's estate. I was tickled that he'd done this when I came home to find it, but I was like you Rosemary: I kind of wondered why anyone would need two monitors? WELL! That didn't last long. I am so spoiled, that now that I'm looking at getting either a laptop or an iPad or a netbook or something of that nature to allow me to be "connected in the field" for our tea business---I keep running up against the wall of realizing over and over again that I'll have to go back to ONLY ONE monitor, how shall I ever survive?! I have enjoyed your perspective and the insights offered by everyone else. Thanks for writing about this Rosemary, et al! My law partner works on three screens. Like Surround Sound but with words. Sitting at his desk makes me dizzy. Today's a fiction day, and I've got one screen and two binders (almost wrote notebooks, but I mean paper punched into one, not a little computer! ), one with the pages so far and one with the outline, character info, map, etc. I've convinced myself that the piles on my desk are useful after all -- they're propping the binders up. Hank, I am often dumb as a stump, but thanks for the nice words. 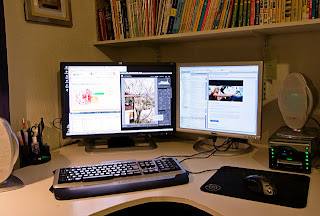 I have never thought of using two monitors but I have to say this is a very intriguing idea; for me it would be nice to have the outline/notes up on one monitor, the manuscript on another. I might have to figure out how this might work with my Apple laptop. Thanks for sharing the idea! As to Scrivener, I just started using it at the beginning of this month (for NaNoWriMo) and have been loving it!! I tried creating outlines in a text editor and then was flipping back and forth between files, then I tired hand writing it out and that lasted all of 10 minutes, well okay a little longer, but being short on space to lay out said paper didn't help that either. Then along came Scrivener and I am a happy camper. There is so much it can do, more than I even realize I'm sure. It helps watching some of their tutorial videos too - I've learned a ton from those. For anyone who is interested in writing in Scrivener, I can't recommend David Hewson's little e-book, Writing a Novel in Scrivener, highly enough. The Scrivener tutorials are good, but I'm not the least bit interested in using it for anything but writing novels, and that's obviously what David focuses on. Great stuff. I will let you know how the actual working-in-Scrivener project progresses. And just in case you all think I've gone over to the techie side, I not only keep a "novel journal" where I keep track of my progress, ideas, paste photos, and otherwise do all sorts of things that I COULD do in Scrivener. But I like the connection of pen and paper. And I usually write several pages in a "scribble journal" before I go to bed every night. Helps me get started the next day. Oh, my captcha was "reright." Is the universe sending me a message? And Jeff, so great to see you here..congratulations on your PW starrred review! And I'd adore to have an outline on a second screen!